Noel Keywood is your guide to some interesting new loudspeaker technologies. It's that time of the year again! 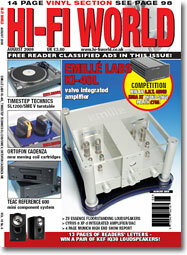 David Price and Adam Smith give out Hi-Fi World's alternative awards! David Price and Adam Smith trek around one of the world's best hi-fi shows for three days, and here's what they've got to show for it! at budget, mid and high end price points respectively. Steven Green tunes in to a versatile new DAB radio. Noel Keywood reviews this feisty sounding high end tube integrated amplifier. David Price tries out an interesting new modular DAC-equipped integrated. David Price is beguiled by this sweet sounding high end CD spinner. Noel Keywood experiences these unusual high end floorstanders! An interesting new affordable mini system is auditioned by Paul Rigby. Adam Smith tells the story of a cult classic nineteen seventies loudspeaker. David Price assembles the ultimate Technics SL-1200 turntable package including Timestep PSU, SME Series V tonearm and Koetsu Red cartridge! Patrick Cleasby reviews this new premium priced USB turntable. Paul Rigby tries out a super new record cleaning machine. Tony Bolton auditions an impressive mid-price phono stage. Noel Keywood purloins a pair of brand new high end moving coils from the Ortofon stand at the Munich High End Show! Your chance to win A.N.T. Audio's superb Kora 3T Ltd. phono stage worth �775. All our favourite new kit listed for your perusal! Paul Rigby treatment this month.